Editor’s Note: We’re excited to welcome Andy Bottoms and his terrific Bracketology insights to Inside the Hall for the 2017-18 season. Andy is a longtime friend of the site and a co-host of The Assembly Call postgame show. He’s also one of the Web’s best and most respected bracketologists. Before we dive into my preseason field of 68, I wanted to thank Inside the Hall – and Alex more specifically – for hosting my bracketology work this season. At the Assembly Call, we’ve certainly enjoyed our partnership over the last few seasons, and I hope this proves to be another success story in that regard. Now, on to my educated guesses as we head into the season. The reality is that this set of projections are the toughest to do because there simply isn’t actual data to use. Early season results provide the opportunity to overreact, but at least those overreactions are based on things we’ve actually seen as opposed to complete speculation. Ultimately that’s why I’m unlikely to produce another set of projections until after the first of the year. In terms of methodology, I try to absorb as much preseason content as I can, whether that’s online or in print, data-driven or subjective. I review the 1-351 rankings that many sites are posting and look through past performance, returning production, and potential breakouts for the teams that profile as contenders in their league or the at-large pool. No matter how futile this preseason exercise may seem, it’s one I always enjoy. From a practical standpoint, it helps to build my initial list of teams to monitor as the season begins. But above and beyond that, it gets me excited for the upcoming season. At heart, I’m just a guy who has loved college basketball for as long as I can remember, and given the important role IU basketball played in building that love, I suppose Inside the Hall is the perfect home for my work. The field will be released over the next four days, hitting four seed lines at a time. So without further ado, here’s a look at the 13-16 seeds, who represent my picks to win the automatic bids in their respective conferences. Morgan State (First Four) – The MEAC looks to be a four-horse race, but I’m giving the nod to the Bears. They finished 11-5 in the league last season and return six of their top seven scorers, led by the dynamic senior duo of Tiwian Kendley and Phillip Carr. Kendley averaged 21.0 points and 5.3 rebounds last season, while Carr posted 16.6 points and 9.6 boards per game and was named the MEAC defensive player of the year. St. Francis, PA (First Four) – I have yet to see anyone pick against St. Francis to win the Northeast Conference this preseason. The Red Flash boast three players who scored at least 12 points per game last year. Isaiah Blackmon and Jamaal King form a solid 1-2 punch in the backcourt, while 6-foot-4 sophomore forward Keith Braxton (13.1 ppg, 8.6 rpg, 3.1 apg, 1.4 spg) does a little bit of everything. Braxton won NEC rookie of the year last season and may just wind up its player of the year in 2017-18. 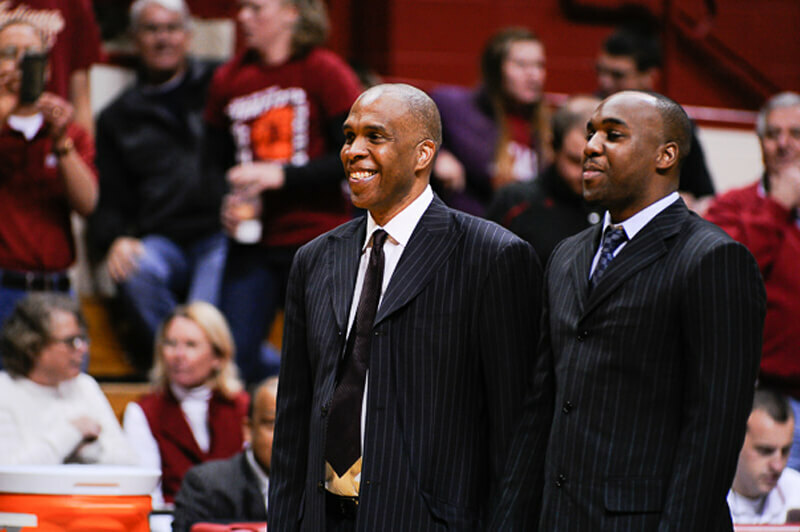 Texas Southern (First Four) – After winning the last four SWAC regular season titles, former IU coach Mike Davis has his eyes on a fifth straight this year. That task won’t be easy with essentially three rotation players back in the fold. Demontrae Jefferson scored nearly 15 points per game and dished out 3.3 assists as a freshman, but the offensive headliner should be grad transfer Donte Clark. He led UMass in scoring a season ago and will immediately be one of the SWAC’s top players. UC Irvine (First Four) – Given some massive personnel losses for the Anteaters, I wouldn’t say I’m supremely confident in picking them to win the Big West. There are a number of sophomores poised to take on larger roles, and UC Irvine has a solid defensive track record to go with the reigning defensive player of the year in Jonathan Galloway. Ideally the defense will keep games close while the offense sorts itself out. Stephen F. Austin – The Lumberjacks are my pick to win the Southland, as they return five players who averaged at least 8.5 points last season. Leading the charge is forward T.J. Holyfield, who led the team in points and rebounds and is part of a formidable frontcourt duo with Leon Gilmore III. Ty Charles has played in a pair of NCAA tournaments and hopes to stay healthier in his senior season. Idaho – The Big Sky should be among the most closely contested leagues, as I’ve seen five different teams picked to win the conference in various preseason projections. Victor Sanders poured in 20.9 points per game last season and also finished among the league leaders in assists and steals. The return of Perrion Callandret, who missed last season due to injury, should allow Sanders to play more off the ball as a senior. Samford – Furman and Mercer should also contend in the SoCon, but I’m going with the Bulldogs, who return all five starters from a 20-win squad. Scott Padgett’s club is led by the inside-outside combination of guard Demetrius Denzel-Dyson and forward Wyatt Walker, who nearly averaged a double-double last season. Two other players scored in double figures, and Alabama transfer Justin Coleman also becomes eligible in the backcourt. South Dakota State – I’m just not going to bet against Mike Daum in the Summit League. The 6-foot-9 junior averaged 25.1 points and 8.1 rebounds last season while making better than 40 percent from beyond the arc. The Jackrabbits do lose a few key pieces, but there are still some solid complements to Daum, who has an outside shot at averaging 30 points. Iona – Tim Cluess and the Gaels must replace their top three scorers, but Rickey McGill gives them a solid point guard to build around. Deyshonee Much and E.J. Crawford will be asked to build on solid offensive seasons a year ago, as Iona tries to hold off the likes of Monmouth and Manhattan in the MAAC. UNC-Asheville – The Bulldogs are the odds-on favorite to win the Big South thanks to an impressive stable of guards. Six-foot-three senior Ahmad Thomas averaged 18.0 points, 6.6 rebounds, and 3.0 steals last season and was named the league’s top defensive player, while MaCio Teague poured in 15.4 points per game as a freshman. Throw in Kevin Vannatta, who was among the top assist men in the league, and you have a backcourt that will lead the way for UNCA. Western Michigan – Expect a close race in the MAC this season with a number of teams emerging as legitimate contenders for the league’s automatic bid. I gave the Broncos the nod over the likes of Buffalo and Ball State thanks to their depth and the play of Thomas Wilder. They return six players who scored at least five points per game, but Wilder is straw that stirs the drink. The senior point guard scored nearly 20 points per game last season but also grabbed 4.3 rebounds and dished out 3.8 assists. Grand Canyon – The Lopes are finally eligible to earn a trip to the Big Dance, and Coach Dan Majerle has his team poised to do just that. Joshua Braun knocked down over 40 percent from beyond the arc last season on his way to averaging 17.5 points, which positions him as a natural pick for WAC player of the year. Majerle also adds Oregon transfer Casey Benson to an already experienced squad that I’m picking to hold off New Mexico State and win the league. Belmont – While Murray State and Jacksonville State could knock them off, it’s tough to pick against Rick Byrd and Belmont in the Ohio Valley. The loss of Evan Bradds is a big one, but the Bruins do return Austin Luke, who finished second in the nation in assists. Amanze Egekeze and Dylan Windler both averaged at least nine points and five boards last season and will look to shoulder even more of the load offensively. Florida Gulf Coast – The Atlantic Sun looks like a two-horse race between Dunk City and Lipscomb. FGCU boasts an outstanding trio of guards in Brandon Goodwin, Zach Johnson, and Christian Terrell, who combined to average over 40 points, 10 rebounds, and nearly 10 assists last season. There are some questions in the frontcourt, but there are enough potential options to think that won’t be a long-term issue. UT-Arlington – Despite the loss of three starters, the Mavericks are still my pick to win the Sun Belt thanks to the inside-outside duo of Kevin Hervey and Erick Neal. Hervey, a 6-foot-9 forward, posted 17.1 points and 8.5 rebounds per game last season, while Neal dished out 6.6 assists and scored in double figures. Don’t count out Louisiana, Georgia Southern, Georgia State, and Troy in what should be a competitive league. Missouri State – With Wichita State gone, someone else should finally get a chance to win the Missouri Valley. For this year, I’ll side with the Bears, who should compete with Loyola and Northern Iowa for the title. Forward Alize Johnson averaged a double-double last season and has a solid chance to do the same as a senior. Guard Ronnie Rousseau III is back after missing about half of the year and should stabilize things offensively. Yale – The Ivy League projects as a three-horse race between Harvard, Princeton, and Yale, and I ultimately wouldn’t be shocked if any of the three went dancing in March. The Bulldogs lost a pair of key contributors, but they return five players who scored at least seven points per game last year as well as Makai Mason, who missed the entire season after averaging 16.0 points and 3.8 assists in 2015-16. Oakland – Valpo has moved out of the Horizon and into the Missouri Valley, but I’m inclined to believe Oakland would be the favorite either way. The Golden Grizzlies lost Sherron Dorsey-Walker, but they do return a pair of guys who averaged over 15 points per game. Martez Walker led the team in scoring last season, while Jalen Hayes contributed 15.9 points and 8.0 rebounds per game. Oakland also adds Illinois transfer Kendrick Nunn, who averaged 15.5 points in the Big Ten in 2015-16 and should immediately become one of the conference’s top offensive players. Follow Andy on Twitter (@andybottoms) for more thoughts on college hoops and to receive an update whenever new brackets are posted. Yes, welcome Andy, follow you on Assembly Call. On another point, who is that with Mike Davis in the above picture? For those that haven’t followed Andy in the past, he’s awesome. Welcome aboard, looking forward to reading more of your projections.